From March 24th to 27th the annual Duty Free & Travel Retail Summit of the Americas will be held in Florida at the Hyatt Regency in Orlando. 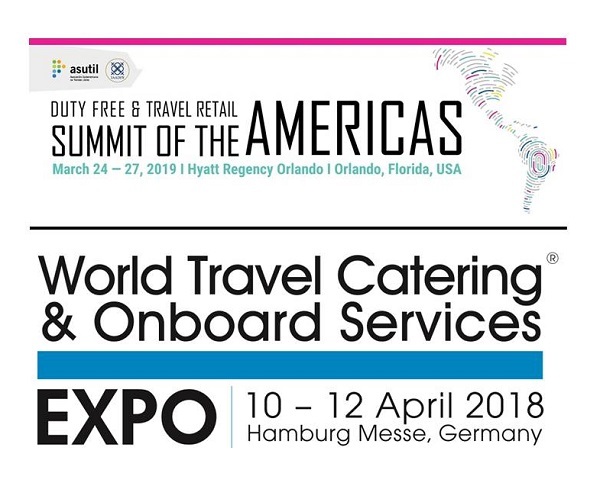 From April 2nd to 4th at the Hamburg Fair will be the moment of WTCE 2019, World Travel Catering&On Board services Expo. These are two of the most important trade shows dedicated to different sectors of the Travel business: on one hand Duty Free of the American continent, on the other hand the services that airlines may need not only for the actual needs but especially to make the offer to their customers increasingly attractive and interesting. For us, therefore, these are important moments of meeting with operators of these sectors during which we can discuss together the main issues and problems of the business and how to face the challenges of the future. These issues can never be considered ordinary form our point of view, infact, our company wishes to continually discuss them with its partners in order to progress together. The only way in our opinion, to be able to really count on and make a difference on the market today, is not by approaching using the old supplier-customer system but the most innovative approach of the partners who work together on a common path. As always, our products are at the center of attention, starting with Bottega Gold Prosecco DOC, Bottega Rose Gold and Bottega White Gold, which remain main objective and desire for all sparkling wines lovers. But our offer to the Travel Retail world certainly does not end here: we include different types of Prosecco DOC, DOCG and Organic as well as the important red wines of Valpolicella such as Amarone and Tuscany such as Brunello. Particularly interesting for this sector are also the creams such as Limoncino Cream or Pistachios Cream.